Immigrants to Germany and their children are at particular risk for tuberculosis (TB). 35 Patients (10 male/25 female aged 2 - 59 years (median 33 years) originating mostly from high incidence countries in Asia (19 [54.3%]) in Africa (14 [40.0%] and East Europe (2 [5.7%]), attended at the Tropical Medicine unit were analysed. Primary clinical presentation was most frequently lymphadenitis (13 [37.1%]). other organs involved included bones (7 [20.0%]), central nervous system (5 [14.3%]), urogenital organs (3 [8.6%]), lung (3 [8.6%]), mediastinum, (2 [5.7%]) and abdomen (2 [5.7%]). ESR was abnormal in 21/28 (75.0%), CRP in 20/35 (57.1%), and protein electrophoresis in 22/26 (84.6%) cases. 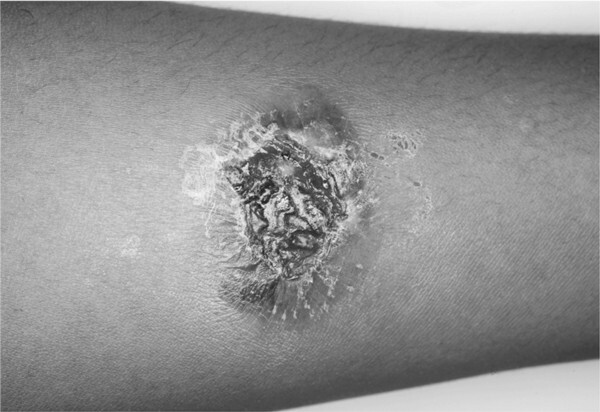 The tuberculin skin test was strongly positive in all 15 cases where the test had been performed. Tuberculosis interferon gamma release assay (TB-IGRA) was positive in all 35 cases (100%). PCR for nucleic acids of Mycobacterium (M.) tuberculosis complex was positive in only 7/20 (35.0%) cases. M. tuberculosis was identified in 32/35 (91.4%), M. bovis in 2 (5.7%) cases. 1 case was diagnosed clinically. All patients were negative for HIV. Typical histopathology was seen in the 29 cases, where biopsies had been taken. Chest-X-ray did not reveal specific pulmonary lesions in the majority of cases (22/35 [62.9%]). Diagnosis of TB was mostly delayed (4 to 299 weeks, [median 8]). The most frequent primary suspicion was a malignancy (17/35 [48.6%]) while TB was initially suspected in 5 cases only. Diagnosis of TB is impeded by its multifaceted presentation especially in immigrants. Tuberculosis is among the oldest, most widespread and serious of all human infectious diseases [1–3]. Worldwide, owing to population growth, poverty, inequity, suboptimal health services, insufficient distribution of antituberculous drugs and the impact of the AIDS pandemic, there are more cases of tuberculosis today than at any previous time in human history . 2 billion people have been estimated by the World Health organization to be infected by tubercle bacilli . In Germany, immigrants and children of immigrants from high incidence countries constitute a particular risk group . Foreign patients and immigrants especially from tropical countries with unclear diseases or suspected tuberculosis are seen at the Tropical Medicine Unit of the University Hospital for Gatroenterology, Hepatology and Infectious Diseases. Physicians of this Unit perform consultancies in other Departments of the University Hospital, as well as in other hospitals in the region. In the Unit, care is taken for TB patients usually after these have been assessed before in other wards. In other patients coming from tropical countries, suspicion of TB may arise during the diagnostic work up for a suspected tropical disease. 35 Patients (10 male/25 female aged 2 to 59 years (median 33 years) were analysed in this retrospective study. Most patients originated from high incidence countries in Asia: India (8), Sri Lanka (3), Kazakhstan (2), Viet Nam (2), Myanmar (1), Turkey (1); and Africa: Morocco (5), Ghana (2), Gambia (1), Senegal (1), Cameroon (2), Kenya (1), Gongo (1), Angola (1). Two patients originated from Kosovo, another two patients originated from Japan. Materials and methods comprise the complete diagnostic work-up at the disposal of a University clinic in an industrialised country. Diagnostic methods for tuberculosis included Mendel-Mantoux tuberculin skin test (TST) with intradermal injection of 0.1 mL of tuberculin PPD RT 23 (Statens Serum Institut, Gopenhagen, Denmark), result read after 48 and 72 hours, tuberculosis (TB)-Interferon-gamma-releaseAssay (IGRA) (T-spot®, Oxford Immunotec, Marlborough, U.S.A.), Ziehl-Neelsen staining and culture of mycobacteria including TB drug resistance testing as well as PCR for nucleic acids of Mycobacterium (M.) tuberculosis complex. Lymphocellular immune-competence was tested by CD4 and CD8 lymphocyte subtype count. HIV-testing was performed in all patients. 28 of the 35 patients were referred from other University Departments: seven children and adolescents from Paediatrics, six patients from Infectious Diseases, five from neurosurgery, three from Otorhinolaryngology, two from Maxillofacial Surgery, two from Orthopaedics, one from Haematology, and one from Gynaecology and Obstetrics. Three patients were referred by other hospitals around Düsseldorf. Two patients presented to our service on their own initiative. One patient was referred by his physician, one by his general practitioner, and one patient was the mother of a TB patient. The most frequent clinical suspicion for the underlying cause of the patients' symptoms was a malignancy (17/35 [48.6%]). Only 14/35 (40.0%) patients' were referred because an infectious disease was suspected of which TB was suspected in 5 cases only (among these was the mother of a TB patient referred by the Public Health Office). Although some patients were attended in the hospital for acute illness, e.g. for a generalised seizure, usually patients with a more insidious onset of disease presented to the doctor some weeks after the symptoms had begun. (time elapsed between onset of symptoms and first visit to a doctor: 0-12 weeks [median 4 weeks]). Main symptoms which prompted the patients to visit a doctor are listed in Table 1. ESR was accelerated in 21/28 (75.0%), CRP was raised in 20/35 (57.1%), protein electrophoresis was abnormal in 22/26 (84.6%) cases: albumin was decreased in 12, increased in 2, alfa-1-globulins were increased in 1, alpha-2-globulins were increased in 4 and decreased in 1 case; beta-globulins were increased 1 case, and gamma-globulins were increased in 16 cases, and decreased in 1 case. TST was strongly positive in all 15/15 cases (100%) where the test had been performed: minimum induration was 18 mm in diameter, the largest 50 × 70 mm. 11/15 cases developed ulcerations (Figure 1) which left a hyperpigmented macula for months after the test had been applied. TB-Interferon-gamma-release-Assay (IGRA) was positive in all 35 cases (100%). PCR for nucleic acids of M. tuberculosis complex was positive in 9/24 (37.5%) cases where this method was applied: PCR of secretory samples (bronchoalveolar lavage and gastric juice) was performed in 9 cases. 4 of these case proved to be exclusively extrapulmonary also by imaging and culture. In the remaining 5 cases with proven pulmonary involvement sensitivity of PCR for M. tuberculosis complex in respiratory secretions was 60% (3/5 cases: 1/3 [33.3%] bronchoalveolar lavage and 2/2 [100.0%] gastric juice. Thus, after exclusion of negative PCR results in respiratory excretions of the 4 exclusively extrapulmonary cases the sensitivity of PCR resulted 45.0% (9/20). PCR is not licenced for non-respiratory secretions. However, sensitivity of PCR was comparable in examining non-respiratoy material (46.2% [6/13]: It was particularly helpful for detecting lymph node TB (5/10 [50%]) and tuberculous endometritis from menstrual blood (1/1). PCR failed to reveal Mycobacterium nucleic acids in urine in one case of urogenital TB and in one case of osseous TB. Strongly positive, ulcerative skin reaction to tuberculin in an Indian TB patient. Cultures revealed M. tuberculosis in 32/35 (91.4%) and M. bovis in 2 (5.7%) of cases as the causative agent. The latter was found in two Moroccan patients. In one 19 year old Angolan female patient with granulomatous uveitis, mycobacteria were neither detected by PCR nor in culture. However, the prompt response to tuberculostatic therapy confirmed the suspicion of tuberculosis in this case. CD4 and CD8 lymphocyte counts and ratios were normal in the 6/6 patients where this test was performed. HIV-testing was negative in all 35 patients. Chest-X-ray showed suspicious lesions in 13/35 (37.1%) cases only. Histopathology findings with typical caseous granulomas infiltrated by giant cells of Langerhans type were seen in 29 cases where guided biopsies had been performed. Primary clinical presentation was most frequently lymphadenitis, followed by osseous involvement, involvement of the central nervous system, urogenital organs, lung, mediastinum and abdomen (Table 2). Patients were classified into exclusively extrapulmonary, exclusively pulmonary and pulmonary+extrapulmonary dissemination. In 4/36 (11.1%) patients acid fast bacilli were seen in smear or bronchoalveolar lavage (open pulmonary tuberculosis). In sputum, bronchoalveolar lavage and/or gastric juice of further 9 patients tuberculosis bacteria could be detected by culture alone. TB was rarely initially suspected by the clinicians (Table 4). First suspicion of the clinicians included malignancies, autoimmune diseases and other infections. The diagnosis was delayed: the time between the first visit to a doctor and established TB diagnosis lasted from 4 to 299 weeks (median 8 weeks). The delayed diagnosis of tuberculosis in our patients may be due to the multifaceted clinical presentation of the disease and to the decreasing familiarity of physicians with this infection in Germany. TB in native patients of German origin most frequently present as pulmonary TB in elderly, debilitated patients . This is one of the reasons why the TB control in Germany after World War II based on mass chest-X-ray screening was successful. Moreover, the delayed diagnosis may be partly due to the particular characteristics of the selected patient collective observed, i.e. HlV-negative immigrants which is not representative for all TB patients notified. For instance, in 2009 in Düsseldorf 60 new cases (31 male/29 female; 32% German, 68% immigrants or foreigners) have been notified. Among these, 72% had pulmonary involvement, 28% were exclusively extrapulmonary. In our cohort, most patients were female and young and had neither respiratory complaints nor B symptoms. In tropical regions, exclusively extrapulmonary presentation of TB is relatively frequent, a notion confirmed by our cohort [2, 4, 5]. Furthermore, TB is usually deemed to increase inflammatory parameters such as ESR, or CRP. These are not only non-specific, but surprisingly, a number of patients even with disseminated TB had normal ESR and/or CRP. The most sensitive parameter would have been an abnormal protein electrophoresis. Nowadays TB-IGRA's are preferred to TST because the IGRA's are more sensitive and more specific than TST [6–11]. Especially, TB-IGRA's although also covering M. bovis are not confounded by previous BGG vaccination . In particular, for the patient collective described, we do not share the opinion that TST is obsolete: firstly, at least in adult immigrants from countries with high TB incidence a positive TB-IGRA does not enable to differentiate between latent inactive and active TB. If we assume that the more than 2 billion TB cases worldwide most frequently occur in high incidence countries, a positive IGRA may be expected in more than one third of people from high incidence countries at least from adolescence on . Secondly, although the TST is usually less sensitive and less specific than TB-IGRA, in our cohort false negative results did not occur. Thirdly, and most importantly, contrary to TB-IGRA, skin reaction to tuberculin can be semi-quantified into weakly to strongly positive. So far, for TB-IGRA, there is no quantitative assessment which would prove active TB . on the other hand, in our patients without overt immuno-incompetence suspicion of TB mostly aroused by the intensity of their skin reaction to tuberculin. This is why, for the moment, we see both tests as complementary tools rather than as mutually exclusive. In future, TB-IGRA may be useful for the diagnosis of active TB when applied to body materials other than blood, e.g. bonchoalveolar lavage, cerebrospinal fluid, pericardial, pleural or peritoneal effusions [13–17]. Performance of PCR for nucleic acids of M. tuberculosis was unsatisfactory. Sensitivity of PCR as compared to culture was lower than 50%. PCR did not perform better in its licensed application on respiratory materials than in its application on other materials. However, a positive PCR was very helpful for speeding up the diagnostic progress and initiation of therapy because of the rather long time interval a TB culture takes to become positive. Tuberculosis in immigrants has particular multifaceted presentations which have to be taken into account by the physician. In immigrants diagnosis is difficult because pulmonary involvement is not constant. This work is part of a medical thesis by Daman Deep Singh. We are indepted to Dr. Ursula Lang, Public Health Office Düsseldorf for communicating us the TB statistic of the Office.